On my way to work: parts of Accra are very modern. And yes, the taxis and trotros (minibus taxis) here generally have religious text on the back window, like above. You might see BLESSED, JUDGMENT DAY, THE DEVIL IS A LIAR, or BE HUMBLE. Friday we had a massive rainstorm, plenty of time in traffic to read window slogans. After three months of cooler weather (under 28C) here in Accra, the heat is coming back. Phew. After a grocery run to Marina Mall (for cheapest UHT milk) by Uber yesterday morning, I was already feeling woozy from the heat. And it’s not even that hot yet…. Still, I am really happy I spent the last weekends sorting through cupboards and closets so most of that is done before we move. Risengrynsgrøt (Norwegian rice porridge) is now spluttering away in the slow cooker, and chickpeas are soaking for tomorrow. We are working our way through the food left: lots of pulses, seeds and mystery ice-crusted boxes in the freezer. So far it is still a fun challenge: buy fresh vegetables and fruit, soak and cook a batch of beans/lentils/cowpeas in the slowcooker, and see what we can cook. Last weekend it was a dried split yellow peas, which ended up in soup and this lasagna. Night before: soak the split yellow peas, if using. The ones I have take ages to cook even when soaked, despite the package saying soaking not needed. Lentils would be fine too. I try to eat meat-free most of the week, so we have a big stash of pulses. The first year of our mortgage we were so broke, and ate so much beans and lentils…. it is a real luxury to be eating this way by choice, not of necessity. Make pumpkin sauce: Sauté chopped onion and garlic, add cooked split yellow peas and roast pumpkin. Cook 20 min or so. Salt and pepper to taste. With immersion blender, blend until relatively smooth. You’ll need to add some water to make it loose enough to spread. Make bechamel sauce: melt butter, stir in flour, then whisk in milk and bring to boil while stirring, until sauce thickens and is smooth. Stir in 2/3 of the grated cheese, stir until melted. Assemble lasagna: Grease a roasting tin lightly. Spread a layer of pumpkin sauce on base, then a layer of dry lasagna sheets, then a layer of bechamel sauce, with a handful of grated cheese. Keep layering, finish with bechamel and cheese. Bake for 40 mins at 200C. Jamie Oliver’s Asian salmon & sweet potato traybake, where leftovers became…..
Today: Norwegian Christmas dinner with ribbe, surkål, kålrabistappe, raspeballer, flatbrød, tyttebærsyltetøy, akevitt, riskrem. Perfect in the heat! Not really, but the freezer seems to take forever to empty, so big steps needed. Eight weeks left until we move, but I am waiting to see the paperwork before I start giving away cutlery, plates, bookshelves, clothes and such. Not much clutter here, except in the Corner of Doom (things to use up in kitchen). Paella spices? We’ll soak some of that dried salted cod, and make fishcakes and a fishy saffron rice dish. Oodles of sesame seeds and tahini? Tahini cookies coming up. Maybe a chickpea pumpkin curry tomorrow, we shall see. A good Sunday to all. This entry was posted in food and tagged lasagna, living in Accra, pantry challenge, pasta, pumpkin, vegetarian on September 24, 2017 by krumkaker. Lots of weather vocabulary in the Roman news yesterday. Allerta meto, emergenza, nubifragio; maltempo, bomba d’acqua sulla città. Stay home, said authorities. Severe weather warnings, schools closed, lots of rain, hailstorms and thunder. Shops are closed and shuttered, it’s very black out there, but I got home safely from work and am making pumpkin soup. As our windows leak in heavy rain, all the shutters are firmly down and I am watching the changing weather through the sheltered balcony door. 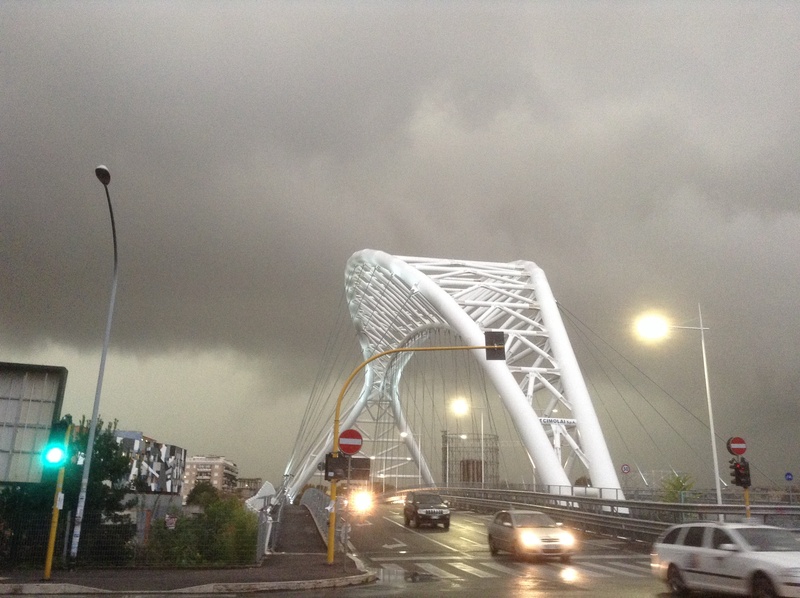 This is our new bridge in Garbatella, just before the skies opened and I was absolutely drenched while walking home from the metro. Fortunately I had pumpkin in the fridge, destined for a risotto with chestnuts, but now becoming soup. Rome is not great when the rain gets heavy; the tombini (drains) overflow, and are often full of leaves and rubbish. Not enough resources to maintain the old drains or prune enough trees, so piazzas flood, trees blow over, metro stops close and traffic slows to a honking, humid, annoyed tangle. Now that I am drying out in my pyjamas, with soup simmering in the kitchen, I am very grateful it has not been worse here. Chop the leek coarsely, after removing base and an inch off the top, and washing and soil off. Sauté in a generous sized pot with the olive oil. 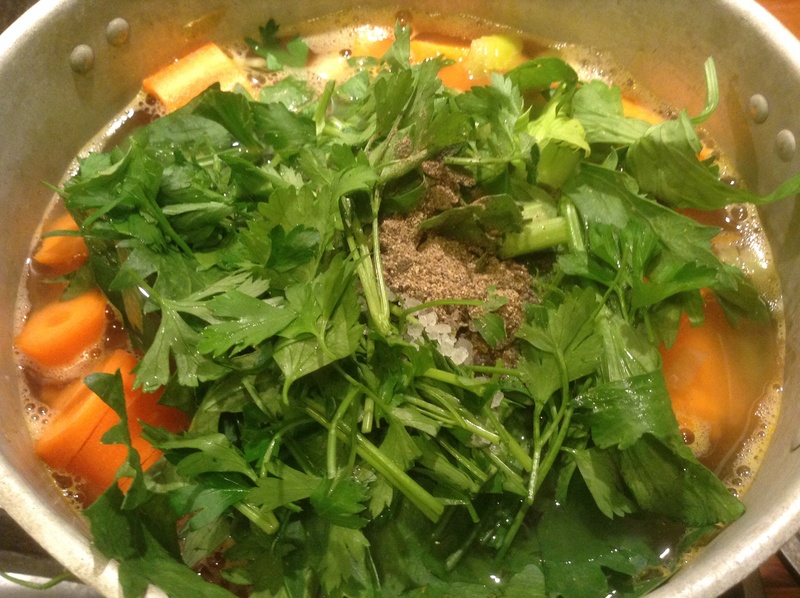 Add chopped celery, cumin, then pumpkin, then stock, chopped carrots, salt, pepper and spices. I used cumin, turmeric and cloves this time, just to try. You might have another spice combination you prefer? Toss it all in the pot, no need to chop anything too finely as it will be blended later. Bring soup contents to the boil, and leave to simmer for half an hour or so. Just enough time to tidy the kitchen, hang up wet clothes, draft a blog post and look at the rolling clouds a bit. I like blended soups, so I used my immersion blender to whiz it all together to a smooth soup, once the carrots had softened enough. Taste it: what do you think the soup might need? Today I enjoyed as it was: warm and slightly spicy, with an aftertaste of the cloves. Hopefully everyone is not too pumpkin-ed out after Halloween, so I’ll bring a large pot of this soup to Fiesta Friday #41. Happy Fiesta Friday to all, and many thanks to the hosts! Notes: I have an amazing pumpkin soup recipe somewhere, but could not find or remember it, so this was assembled from what was on hand. Normally I would add some chill flakes, a couple potatoes, cumin and something: ground coriander, possibly? Maybe some lentils…. but as I am home alone this week, I know I’ll reach pumpkin soup saturation by day three, so I did not want too much soup. This soup should freeze well, though. At least I cooked something! When my husband is away (not often), I succumb to a no-cook diet of cereal, yoghurt and cheese & crackers. I must say, proper home-cooked food tastes amazing after a week of that. This time, since I cooked today, I have soup enough for dinner, and lunch, and dinner, and lunch…… Time for cheese & crackers after that? I may just forage for inspiration at Fiesta Friday. I already have my eye on chefjulianna’s Blueberry Rosemary Focaccia! PS I posted this, and then read the Guardian, where this was published today: To cook or not to cook? A sensual pleasure for some can be plain serfdom for others — interesting reading. 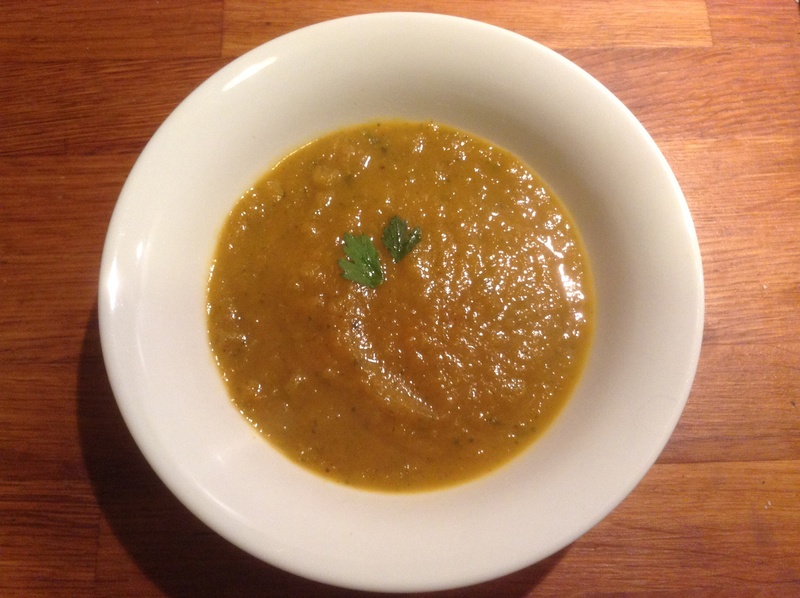 This entry was posted in food and tagged Fiesta Friday, pumpkin, soup, vegetarian on November 7, 2014 by krumkaker.